In a medium saucepan melt the butter and saute the scallions, the garlic and ginger for 5 minutes. Add the tomatoes, pumpkin,bay leaves, cloves, nutmeg,salt and pepper. Allow to cook for 5 minutes. 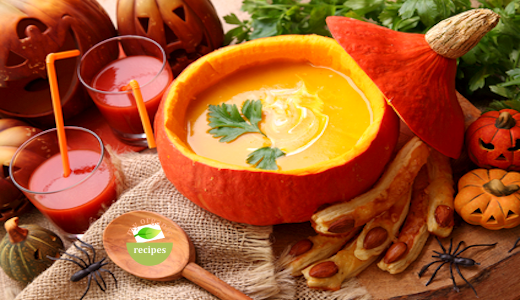 Pour in the homemade vegetable broth , water and coconut milk.. Bring to a boil and then simmer for 40-50 minutes, until the pumpkin is soft. Cool and blend in a food processor. You can warm again before serving.